I made a bunch of toaster waffles earlier this week, and I realized I hadn't moved my waffle recipe over to this blog. So, here it is. I looked at a lot of waffle recipes before I decided on this one. This was the only one I found that didn't call for beaten egg whites, and since I don't like complicated recipes, I knew it was the one! If substituting soured milk for the buttermilk, begin by combining 3 T. vinegar with enough milk to make 3 cups. Let sit at least 5 minutes. Meanwhile, in large bowl (preferably one with a pour spout), mix the flour, baking powder, baking soda, salt and cinnamon with a wire whisk. Add the buttermilk or soured milk, eggs, and cooking oil. Whisk together until smooth. Grease and heat waffle iron (I use 2). Pour batter into heated waffle iron and cook until done. Serve with butter, syrup, and your choice of fruit toppings. Note that this does take some trial and error in figuring out exactly how much batter to pour into the waffle iron. 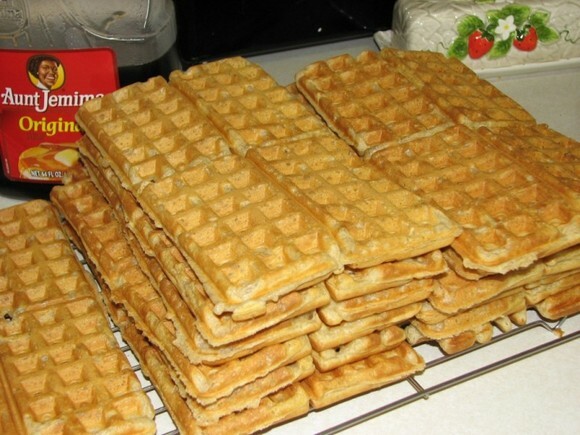 Too little and the waffle isn't completely round, or in the case of the toaster waffles, you don't get complete squares. Too much, and batter leaks out the sides. ... See my Tabblo for this recipe in pictures.